This was doing the rounds on April 1st which fooled nobody, looks like it could soon be legit! Of all the stories floating around the internet today, this one is tailor made for us. From this Autumn, the Xbox Live Rewards program will offer up Microsoft Points based on your Achievements. Yup, you read that right. While details of exactly how this will work have yet to be announced, the news comes direct from the Xbox Live Rewards Twitter account. "Coming Fall: a new way to earn Rewards based on your Achievements!,” said the tweet. Nice, eh? Xbox Live Rewards is a service that offers up MSP in return for carrying out various tasks, like filling in questionnaires and renewing XBL subscriptions. However, it has never rewarded users for their Achievements before. Re: Microsoft Points for Achievements? Years ago (2008?) they had achievement challenges that rewarded XBLA games, gamerpics, etc. for earning X amount of points within a certain time period. They eventually had to stop because of gamerscore modders, but with recent upgrades to XBL integrity maybe they're resurrecting that concept (or something similar)? Microsoft has launched a new Xbox Live Rewards scheme that offers players discounts according to their Gamerscore. There are three separate reward tiers. 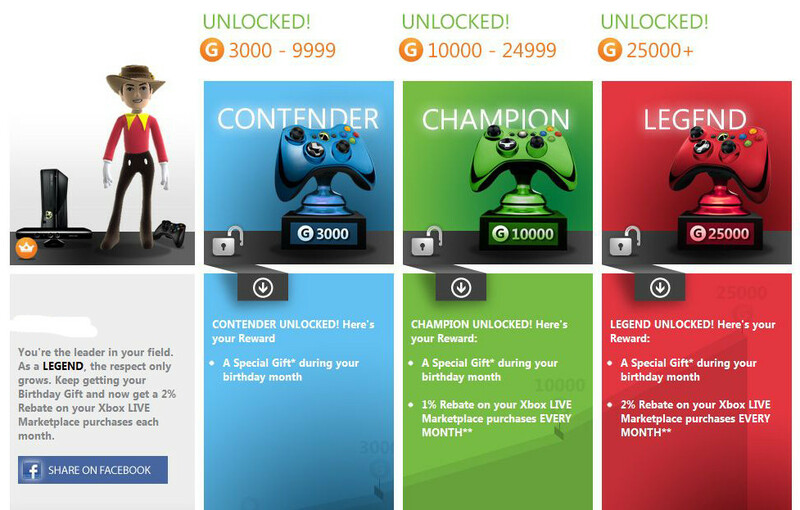 Those with a Gamerscore between 3,000 and 9,999 will be sent a “Special Gift” worth 15p. Those with a Gamerscore between 10,000 and 24,999 receive the gift and are entitled to a 1% rebate on all purchases from Xbox Live Marketplace every month. And last up, those with a Gamerscore in excess of 25,000 will earn a 2% rebate on all purchases every month, as well as the birthday gift. To be eligible all you have to do is activate the Xbox LIVE Rewards scheme on your Xbox Live Gold account. All Marketplace purchases qualify towards the rebates, with the exception of Microsoft Points and Xbox Live memberships. "Unfortunately, you can't join Xbox LIVE Rewards right now. It's strictly because the program is not available in your country. Check back often as new countries are being added to the program." 2%!!! Not exactly what you'd call an incentive to spend some points.. The Birthday prizes are great to, up to $0.25, brilliant! I'd never turn down a free $0.25. But I would also never spend $10 to get $0.20 back. Definitely not an incentive if that's what they were going for.